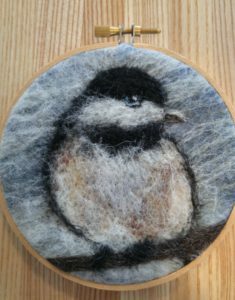 AlgomaTrad is presenting an Art Felting workshop on Saturday, February 2, from 10am to 3pm, with artist Dawn Allard of Willow Creek Farm. Workshop will take place at Sourgrass and Granite Farm (home of Julie and Pat) near Gordon Lake (Desbarats area). Cost for the workshop is $45 and space limited. Call 705 782 4311 0r 705 257 6106 to register, or email music@algomatrad.ca. This workshop is suitable for 12 years of age to adult. Dawn will present a quick overview of the composition of different fibres and how felting works. For the rest of the morning, she will lead participants into wet felting the background to their felting art piece, experimenting with different textures. In the afternoon participants will needle felt a second picture onto the background, learning different blending techniques. Once finished the students will come away with a felted piece of art. Dawn Allard is a felting artist who has been part of the Sylvan Circle Tour. She makes her own soaps as well, which she uses in her felting process. If you want to see more of Dawn’s work check out her Facebook page HERE.